The ASEAN Charter is now available in all the major languages spoken in the ASEAN Member States, with the Philippines introducing the ASEAN Charter in Filipino. The introduction was made during the ASEAN’s 43rd anniversary celebrations at the Department of Foreign Affairs of the Philippines in Manila on 9 August 2010. The Filipino version of the ASEAN Charter is now available for download from the official website of ASEAN. Visit: http://www.asean.org/AC-Philippines.pdf. The ASEAN Charter entered into force on 15 December 2008 and had previously been translated into other various ASEAN languages. Three business councils – the ASEAN Business Advisory Council (ABAC), the East Asia Business Council (EABC), and the US-ASEAN Business Council (USABC) – representing the private sector in the Southeast Asia region, met the ASEAN Economic Ministers in consultations during the week-long ASEAN Economic Ministers Meeting (AEM) in Da Nang, Viet Nam. Dr Doan Duy Khuong, Chairman of ABAC, said the consultations provided an opportunity to convey the needs and requests of the private sector to the ASEAN Economic Ministers. “The progress accomplished this year is halfway towards the realisation of the ASEAN Economic Community (AEC) by 2015. Consultations have become all the more important for us to support the ASEAN Governments and for the concerns of the private sector understood. Greater engagement with business organisations of ASEAN’s priority integration sectors is a praised public-private sector partnership effort,” he said. 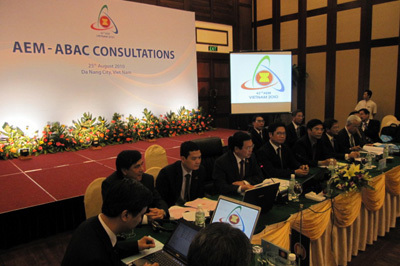 ABAC also briefed the Ministers on the business council’s activities, including its efforts to build ASEAN Trade and Investment Centres (ATIC); a survey to determine how investment strategies in Member States may have changed in the post-global financial crisis; and its plan to organise the 2010 ASEAN Business and Investment Summit (ASEAN-BIS) on the sidelines of the forthcoming 17th ASEAN Summit and related summits in Ha Noi. Meanwhile, Mr Alexander Feldman, President of the USABC said corporations in the United States are looking forward to participate in economic activities in the ASEAN region. “As the process of ASEAN economic integration continues, companies will really be able to take advantage of the sheer size of ASEAN’s market of 600 million consumers. The Council takes seriously its role as the only US-based organisation to participate annually in the AEM, and we intend to expand and continue the work we’ve done over the past year to support ASEAN, “ he said. The USABC is an advocacy organisation for US corporations operating within ASEAN, and has Council Members which include the largest US companies doing business in the Southeast Asia region. Earlier at the opening ceremony of the 42nd AEM and related meetings in Da Nang on Wednesday, the Prime Minister of Viet Nam, H.E. Nguyen Tan Dung, reminded the audience that it is important to rope in the active participation of all levels of community, including the private sector, to support the Member States in realising an integrated economic community. “ASEAN should always remain single-minded about its course of action charted on the basis of its consistent principles in the interest of the Community as a whole. We need to solicit active participation of the community, especially ASEAN businesses and citizens for the successful establishment of AEC,” the Prime Minister said. Although foreign direct investment (FDI) inflows from sources within the region accounted for 11.2 per cent of ASEAN inflows last year – projecting ASEAN as the third largest source of investment in the region – the main sources of FDI inflows to ASEAN are from its Dialogue Partners. The European Union has a share of 18.3 per cent, Japan 13.4 per cent, and the United States 8.5 per cent. This was disclosed during the series of consultations between the ASEAN Economic Ministers and ASEAN Dialogue Partners during the 42nd ASEAN Economic Ministers (AEM) Meeting and related meetings in Da Nang this week. Nine of ASEAN’s Dialogue Partners participated in the consultation sessions: Australia-New Zealand, China, the European Union, India, Japan, the Republic of Korea and Russia. Russia was represented at its first ever consultation by Minister of Economic Development of the Russian Federation Elvira Nabiullina, and the Consultation exchanged views on the various proposals to enhance ASEAN-Russia economic cooperation and the Economic Ministers were tasked to consider the proposals. The ASEAN Economic Ministers also noted that ASEAN trade with Dialogue Partners remain dynamic despite the global economic decline in 2009 as a result of the global financial crisis, and ASEAN has continued to maintain its strong trade relations with its Dialogue Partners, despite significant drops in total trade. The year 2010 saw the implementation of various Free Trade Area (FTA) agreements with them. The ASEAN-China Free Trade Area (ACFTA) and the ASEAN-Korea Free Trade Area (AKFTA) were realised on 1 January this year. The Agreement Establishing the ASEAN-Australia-New Zealand Free Trade Area (AANZFTA), the ASEAN-India Trade in Goods Agreement and the ASEAN-China Investment also came into force on 1 January this year. Minister of Industry and Trade of Viet Nam Vu Huy Hoang, who chaired the press conference, represented the Economic Ministers’ concern on the low utilisation of the FTAs and urged Member States to step up its efforts to socialise the benefits of the FTAs to its business communities in order to maximise the rewards of the agreements. Ministers suggested undertaking public advocacy activities, socialisation of messages in promotional materials and improving trade facilitation through simplification of administrative procedures. The 4th ASEAN Economic Community (AEC) Council Meeting concluded today with the ASEAN Economic Ministers calling for closer coordination with and between the Sectoral Bodies dealing with the different economics-based issues in ASEAN. Dr Vu Huy Hoang, Minister of Industry and Trade of Viet Nam, who chaired the Meeting, said as many areas within the AEC are cross-cutting, it is important to have a greater engagement with and between Sectoral Bodies to facilitate the exchange views and a better understanding of the issues and challenges. He said that although 80 per cent of the deliverables under the AEC Blueprint for 2008-2009 have been achieved, much more needs to be done to address the challenges that remain. For example, there is a need to analyse the root causes of non-implementation that include delays in the ratification of signed agreements, and the alignment of ASEAN-wide agreements into ASEAN Member States’ national laws and legislation. In their deliberations, the Ministers reaffirmed their commitments to realise the vision of the ASEAN Leaders, and called for the timely ratification, implementation and compliance with agreements and protocols that have been signed by their Leaders or predecessors. During the 4th AEC Council Meeting, given the importance of the transport sector in accelerating the ASEAN Connectivity initiative with ASEAN economic integration, the Chairperson of the ASEAN Transport Ministers briefed the meeting on the latest development and challenges of the sector in realising the AEC by the deadline of 2015. Emphasising the key role which the transport sector undertakes in realising the benefits of trade and investment liberalisation, the Ministers noted that challenges remain. These include the timely ratification of the signed agreements, undertaking internal assessments of domestic regulations and concerns that may hold back regional progress and constraints in resources – either providing adequate resources or gathering external ones. The Ministers also took into account the significant progress made in finalising the Master Plan on ASEAN Connectivity, the ASEAN Strategic Transport Plan (ASTP) 2011-2015, the Information Communications Technology (ICT) Master Plan 2011-2015, and the ASEAN Tourism Strategic Plan (ATSP) 2011-2015. The Meeting also called for the AEC to be socialised to the stakeholders such as businesses, so that a sound knowledge of ASEAN and Member States’ efforts can increase transparency and attract a wider participation from the public which would be essential for ASEAN’s community building efforts. The 42nd ASEAN Economic Ministers Meeting and the 4th Meeting of the ASEAN Economic Council Meetings took place this week in Da Nang, Viet Nam. The related meetings will continue until tomorrow and will include Consultation sessions with Dialogue Partners and business councils. Please click here for the Joint Media Statement of the 4th AEC Council Meeting. The 42nd ASEAN Economic Ministers (AEM) Meeting, which began yesterday in Da Nang, under the theme “ASEAN Economic Community: A Community for Dynamic and Sustainable Growth”, concluded today with the resonance of a sound economic recovery in ASEAN. The ASEAN Member States also expressed their commitment to support ASEAN’s efforts to accelerate the region’s economic recovery. Minister of Industry and Trade of Viet Nam, Dr Vu Huy Hoang, who chaired the plenary and press conference, reiterated the confidence of Member States that the improving global economic environment, among other factors, will further improve the economic conditions of the region. During their meeting, the Ministers reviewed the status of measures that were being implemented in the ASEAN Economic Community (AEC) Blueprint and reaffirmed their commitment to ensure timely and substantive implementation of the measures in the Blueprint. They repeated their resolve to ensure the credibility and integrity of ASEAN economic integration with the realisation of a single market and production base before the deadline of 2015. Expressing their concern on the unequal development within ASEAN, the Ministers emphasised the importance of narrowing the development gap among the Member States, so that the less developed members of ASEAN are able to participate and benefit meaningfully from ASEAN’s community building process. The implementation of the Initiative for ASEAN Integration (IAI) Work Plans I and II will be carried out in the hope to narrow the development divide. They also underscored the importance of bringing small- and medium-enterprises (SMEs) into the mainstream of ASEAN economic integration and requested the setting up of the SME Advisory Board as soon as possible. They also reiterated the importance of engaging the private sector to ensure greater synergies in developing and integrating the region, and encouraged the public and private sectors to continue holding frequent dialogues with industry associations and private sector representatives from ASEAN and its Dialogue Partners. With the world economic growth expected to increase to over 4 per cent in 2010 and 2011, key Asian economies in the world such as China, India and the ASEAN Member States will lead the way and bring ASEAN’s real GDP growth to over 5 per cent this year, compared with just 1.5 per cent last year. “Part of the growth within ASEAN is attributed to the stimulus package from some of the governments of the Member States, but this dependence cannot be sustained and ASEAN must work harder to encourage business among the Member States,” said the Secretary-General of ASEAN, Dr Surin Pitsuwan. ASEAN’s total merchandise trade in 2009 contracted by only 19 per cent, from US$ 1,897.1 billion in 2008 to US$ 1,536.8 billion in 2009, as compared to global trade which dropped by 22.6 per cent. Trade among the Member States declined by 20 per cent, while trade with the rest of the world reduced by 18.7 per cent. ASEAN, however, continued to maintain its strong trade relations with its Dialogue Partners, with China leading the way, and the European Union and Japan in second and third place, despite significant drops in total trade. ASEAN’s trade surplus with the rest of the world stood at US$ 61.2 billion in 2009, which is more than double the level the year before. The ASEAN Free Trade Area (AFTA) was realised on 1 January this year, with the ASEAN-6 removing the duties on 99.65 per cent of all tariff lines under the Common Effective Preferential Tariff Scheme for the ASEAN Free Trade Area (CEPT-AFTA), while Cambodia, Laos, Myanmar and Viet Nam have reduced 98.96 per cent of total tariff lines to 0.5 per cent range. The ASEAN trade in Goods Agreement (ATIGA) also came into effect on 17 May this year. On the area of investment, the Ministers agreed to progress work to facilitate greater ASEAN investment flows through joint marketing promotions, and advancing work on best practices on investment. Last year, ASEAN’s share of total global FDI inflows increased to 3.6 per cent, from 2.8 per cent the year before, which demonstrated ASEAN’s attractiveness as an investment destination, even when the lower overall value of FDI inflows was only US$ 39.6 billion last year. But foreign direct investment (FDI) inflows into ASEAN are expected to rise in the year 2010 and beyond, and experts estimated an increase of global FDI inflows to US$ 1.2 trillion this year and to as much as US$ 1.3 to US$ 1.5 trillion next year. The main sources of FDI inflows to ASEAN are with its Dialogue Partners – the European Union has a share of 18.3 per cent, Japan 13.4 per cent, and the United States 8.5 per cent. Inflows from sources within the Member States accounted for 11.2 per cent of ASEAN inflows last year, pushing ASEAN as the third largest source of investment in the region. The services, manufacturing, and mining and quarrying sectors are the top three components in FDI inflows into ASEAN. “Every relationship requires an adjustment – some may have more problems than the others – but each of the Member States is working to implement the agreement, and each agreement has flexibilities of a certain degree built in to them so that no one particular party will be adversely affected in order to benefit from the rewards of the agreement,” he added. Apart from the ACFTA, and the Agreement Establishing the ASEAN-Australia-New Zealand Free Trade Area (AANZFTA), the ASEAN-India Trade in Goods Agreement and the ASEAN-China Investment also came into force on 1 January this year. Ministers, however, were concerned about the low utilisation of the FTAs and urged Member States to step up its efforts to socialise the benefits of the FTAs to its business communities in order to maximize the rewards of the agreements. The ASEAN Economic Ministers’ related meetings this week will also include Consultation sessions with most of ASEAN’s Dialogue Partners: Australia-New Zealand, China, the European Union, India, Japan, the Republic of Korea and Russia. Consultations with business councils will also be convened. Please click here for the Joint Media Statement of the 42nd AEM Meeting. ASEAN has recorded remarkable milestones in its efforts so far to build an ASEAN Economic Community (AEC), but the region will not be insulated from the influences and setbacks from the regional and global economic conditions. The active engagement of the ASEAN Member States and participation of the community, however, will ensure that ASEAN’s commitment in developing an economically integrated region will continue to be pursued. The Prime Minister of the Socialist Republic of Viet Nam, H.E. Nguyen Tan Dung, whenopening the 42nd Meeting of the ASEAN Economic Ministers in Da Nang today, said 2010 has so far witnessed ASEAN’s solid economic recovery, which is attributable to the improvements in the world economy. Credit, he said should also be given to the initiatives implemented by each Member State, especially the timely policy intervention to restore the confidence of investors, businesses, and the people. Prime Minister Nguyen Tan Dung commended how the region’s economic community has made remarkable progress with the gradual translation into reality of AEC’s integration commitments and core economic cooperation programmes despite the volatile economic situation. “Challenges, nonetheless, remain given the potential macro-instability, climate change and natural disasters, but hopefully these challenges will continue to be bolstered by mutual support, understanding and sharing among the Member States,” he said. The Prime Minister called for several steps to be taken to ensure the success of an AEC. “I suggest that our ASEAN Economic Ministers’ Meeting focus on these: To seek practical and innovative solutions to promote the strict and effective implementation of the AEC Blueprint by 2015; and to pursue balanced and sustainable development policies, balancing economic development targets and macro-economic stability, social development and effective response to global challenges.” He also called for the strengthening of the current framework for economic cooperation between ASEAN and Dialogue Partners, as well as the implementation of concrete and robust measures to narrow the development gaps among countries and regions in ASEAN. The ASEAN Economic Ministers’ related meetings this week will also include Consultation sessions with most of ASEAN’s Dialogue Partners, including Australia-New Zealand, China, the European Union, India, Japan, the Republic of Korea, and Russia. Drawing attention to the important role played by small and medium-sized enterprises in the region, Prime Minister Nguyen Tan Dung said that the SMEs should not be left behind in the region’s economic progress, and that the success of the AEC must address the voices of the community. “ASEAN cooperation mechanisms should provide greater opportunities for businesses, especially small and medium-sized enterprises, to understand and actively engage in the ASEAN economic integration process. But ultimately, it is desired that the results brought about by the AEC should reflect the aspirations of and yield dividend to ASEAN business and people,” he added. Viet Nam is the Chair of ASEAN this year, and the Chairmanship coincides with the country’s 15th anniversary of its ascension into ASEAN. The 42nd Meeting of the ASEAN Economic Ministers Meeting related meetings are taking place this week in Da Nang, Viet Nam. The related meetings will also include Consultation sessions with Dialogue Partners and Business Councils. The ASEAN Economic Ministers-13th ASEAN Investment Area (AIA) Council Meeting in Da Nang yesterday welcomed signs indicating a recovering global economic climate and a more optimistic forecast for economic growth in the region. The expansion in global growth, expected to increase to over 4% in 2010 and 2011, will be led by key economies in developing Asia, particularly by China, India, and the ASEAN Member States. Against the backdrop of a healthier global economy, the forecast for ASEAN’s real GDP growth in 2010 is over 5 per cent, against 1.5 per cent in 2009. On investment, it is anticipated that ASEAN will receive higher foreign direct investment (FDI) inflows in 2010 and beyond, after suffering a downturn in 2008 and 2009, following the global economic crisis. This is borne out by United Nations Conference on Trade and Development (UNCTAD) estimate of an increase in global FDI flows from US$ 1.2trillion in 2010 to US$ 1.3-1.5trillion in 2011. ASEAN has also been successful in grabbing a larger share of the global FDI pie. The region’s share of total global FDI inflows increased from 2.8 per cent in 2008 to 3.6 per cent in 2009, even with the recent economic downturn. This success is a good indicator that the ASEAN region, riding on its integration efforts, will have the ability to continue to attract a higher share of investment flows, despite the lower overall value of FDI inflows of US$ 39.6 billion in 2009, due to the global economic crisis. ASEAN-6 (Brunei Darussalam, Indonesia, Malaysia, Philippines, Singapore and Thailand) are still the biggest recipients of FDI and the top four most attractive investment destinations within ASEAN in 2009 were Singapore (41 per cent), Viet Nam (19 per cent), Thailand (15 per cent), and Indonesia (12 per cent). However, CLMV countries (Cambodia, Lao PDR, Myanmar and Viet Nam) are becoming increasingly appealing to investors, accounting for 23 per cent of total ASEAN FDI flows in 2009. The Ministers, however, acknowledged that improvements in FDI flows will continue to be dependent on global recovery conditions. The Secretary-General of ASEAN, Dr Surin Pitsuwan, said ASEAN Member States may have been successful in attracting foreign investment, but this cannot be taken for granted. “The impact of the global recession would intensify the competition for foreign investments in the future,” he said. “The challenge for ASEAN is to formulate and implement solutions to further enhance our investment climate, so that we may continue to attract and retain FDI during uncertain times”, he said. “Nationally, Member States need to further improve its competitiveness, and collectively, all Member States need to project ASEAN as a truly integrated market,” he added. Dialogue Partners have also been instrumental in helping ASEAN achieve these figures. The European Union, with a share of 18,3 per cent, still remains the biggest investor in ASEAN, while Japan is second at 13.4 per cent and the United States at 8.5 per cent. The inflows from intra-ASEAN sources, which accounted for 11.2 per cent of ASEAN inflows in 2009, are important and this has helped make ASEAN the third largest source of investment for the region. Three sectors remain important in their contribution to FDI inflows. The services sector continued to account for the highest levels of FDI inflows, amounting to US$ 26.8 billion or 68 per cent of total ASEAN FDI inflows in 2009; the manufacturing sector was second with US$8.5 billion or 22 per cent; and the mining and quarrying sector accounted for US$ 3.2 billion, which is 8 per cent of the total FDI flows into ASEAN. Despite the regional achievements, the Ministers advised against complacency and urged further actions to attract FDI flows. They stressed the importance of further enhancement of intra-ASEAN FDI as a significant factor in increasing ASEAN’s competitiveness and resilience in times of crises. The Ministers agreed to progress work to facilitate greater ASEAN investment flows through joint investment promotions; advancing work on cross-border investment initiatives; and engaging the private sector in further consultations to obtain feedback on improving the ASEAN investment climate. Minister of Industry and Trade of Viet Nam, Dr Vu Huy Hoang, chaired the 13th ASEAN Investment Area (AIA) Council Meeting, which followed the 24th ASEAN Free Trade Area (AFTA) Council Meeting. Both Council Meetings took place on 24 August in Da Nang, Viet Nam. For the Joint Media Statement of the 42nd ASEAN Economic Ministers’ (AEM) Meeting (Investment Inputs), please click here. The economic performance of ASEAN in 2009 had not been immune to the global economic crisis, but ASEAN’s performance in trade had exceeded that of the world, ASEAN Economic Ministers learnt yesterday at the 24th ASEAN Free Trade Area (AFTA) Council Meeting in Da Nang, Viet Nam. Trade statistics showed that due to the impact of the global financial crisis on the region, ASEAN’s total merchandise trade backtracked from US$ 1,897.1 billion in 2008 to US$ 1,536.8 billion in 2009. However, this 19 per cent decline as compared to the 22.6 per cent decline in worldwide trade demonstrated the strength of the ASEAN economy. In response to these challenges, Ministers emphasised their determination of adopting bold measures, particularly on trade facilitation and elimination of Non Tariff Barriers, to spur intra-ASEAN trade. In 2009, trade among the ASEAN Member States was affected by 20 per cent and trade with the rest of the world was affected by 18.7 percent. But trade with ASEAN’s Dialogue Partners continued to excel. Despite a 9.5 percent reversal in total trade, China emerged as ASEAN’s largest trading partner in 2009, with the European Union and Japan trailing in the second and third places respectively. ASEAN’s trade surplus with the rest of the world reached US$ 61.2 billion in 2009, which more than doubled from the previous year. On trade in goods, the Meeting reported that the year 2010 has marked great milestones. The ASEAN Free Trade Area (AFTA), which was realised on 1 January 2010, eliminated duties on 99.65 per cent of all tariff lines under the Common Effective Preferential Tariff Scheme for the ASEAN Free Trade Area (CEPT-AFTA). For Cambodia, Lao PDR, Myanmar and Viet Nam, tariffs on 98.96 per cent of total tariff lines have been adjusted to within the 0-5 percent range. The ASEAN Trade in Goods Agreement (ATIGA), which consolidates all ASEAN’s existing initiatives, obligations and commitments on intra-ASEAN trade-in-goods (including both tariff and non-tariff elements) into one single comprehensive document, also entered into force on 17 May 2010. On the elimination of Non-Tariff Barriers, the Meeting commended the positive progress in the verification of Member States’ lists of Non Tariff Measures (NTMs), and encouraged a tighter coordination among the various ASEAN Sectoral Bodies. This is in order to ensure seamless implementation of the mechanism to monitor NTMs under the ATIGA and to address the operational challenges it may bring. The Ministers also reaffirmed their country’s commitment to eliminate Non-Tariff Barriers so that the benefits from tariff reduction under the ATIGA can be maximised. On trade facilitation, the Meeting acknowledged substantial efforts of making trade facilitation working for the ASEAN Economic Community. Several Member States embarked on the development of the Self Certification Scheme to further smoothen a freer flow of goods which originate from the region. 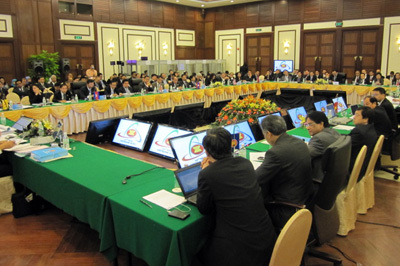 In an effort to monitor and evaluate the progress of trade facilitation, the Meeting endorsed the updated ASEAN Trade Facilitation Work Programme and mandated that each Member State should conduct a survey of the status of the country’s trade facilitation, by way of a common set of questionnaire across the region. On ASEAN Single Window (ASW), the Meeting requested the Member States to accelerate full implementation of the National Single Windows and ASW. Brunei Darussalam, Indonesia, Malaysia, Philippines, Singapore and Thailand have activated their National Single Windows (NSWs) and their efforts to expand the operational scope of their NSWs. Meanwhile, Cambodia, Lao PDR, Myanmar and Viet Nam are undertaking preparatory work to implement their own NSWs. Minister of Industry and Trade of Viet Nam, Dr Vu Huy Hoang, chaired the AFTA Council Meeting, which was convened ahead of the 13th ASEAN Investment Area (AIA) Council Meetings. 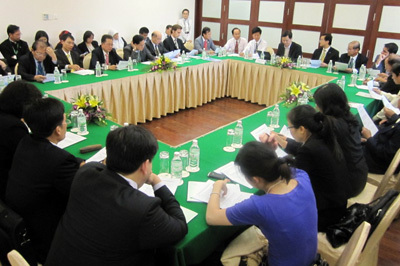 Both Council Meetings took place on 24 August 2010 in Da Nang, Viet Nam. For the Joint Media Statement of the 42nd ASEAN Economic Ministers’ (AEM) Meeting (AFTA Council – Related Section), please click here. Representatives from the ASEAN Member States and the businesses in the logistics services sector meeting at a policy dialogue in Da Nang today were unanimous on the importance of an effective public-private partnership in building an important bridge to match government policies with business demands. 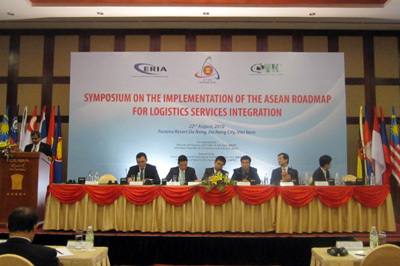 In a spin-off event from a symposium held a day earlier, which reviewed the status of implementation of the ASEAN Logistics Roadmap and logistics-related commitments in the ASEAN Economic Community (AEC) Blueprint, the ASEAN Economic Ministers and the representatives of the logistics services companies in the region held the dialogue to exchange views and consider recommendations on the logistics services sector in the region. Both sides agreed that while hard infrastructure is the foundation to support the overall physical connectivity, enhancements in policy and facilitative actions are also equally crucial to increase the competiveness of the logistics sector to enhance the ASEAN region’s appeal as a profitable trade partner and investment destination. Mr Dave Tan, Executive Director of the Conference of Asia Pacific Express Carriers (CAPEC), said public-private partnership is important in many areas of logistics services, from joint projects in developing logistics infrastructure and services, to human resource development. Representing the logistics services businesses in the region, Mr Tan recommended to the ASEAN Economic Ministers that the public and private sectors undertake concrete steps to work together to develop the logistics sector. “We recommend that ASEAN institutionalises a public-private sector policy dialogue on logistics issues with an annual dialogue session at the sidelines of the Senior Economic Officials Meeting / Senior Transport Officials Meeting and a national public-private sector forum for an exchange of views and to provide inputs to the respective government for consideration in policy formulation,” suggested Mr Tan. “Meanwhile, the private sector will assist in providing information on best practices, advancements in technology, market developments and collaborate in human resource development,” he offered. The private sector further recommended the establishment of a Business Sector Checklist to monitor the progress of the logistics services sectors identified in the Roadmap, based on, if not preferably ahead of, the timeline and targets committed in the AEC Blueprint. The checklist would be accompanied by a comprehensive study to identify behind-the-border barriers. They also called for each Member State to nominate a central coordinating agency within the government with strong coordination capabilities, to act as a focal point and take charge of the respective country’s logistics facilitation and liberalisation efforts. Mr Hidetoshi Nishimura, Executive Director of the Economic Research Institute for ASEAN and East Asia (ERIA), who co-organised and supported the Symposium, reconfirmed ERIA’s commitment to provide continuous intellectual support to the challenges in implementation. “For the past one year, ERIA had conducted intensive research work on the Comprehensive Asia Development Plan and supported the drafting efforts of the ASEAN Connectivity Master Plan,” he said. “ERIA believes it is imperative that we improve physical connectivity and institutional connectivity to create a better business environment in this region, so we will render assistance for further communication between policy makers, business and academia,” he added. Today’s policy dialogue provided the platform for the private sector to present their recommendations to the Member States which also took the opportunity to discuss the respective challenges of their country and different ways how the governments can help to further improve the logistics sector at the regional level. 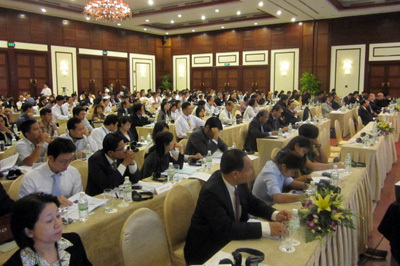 The one-day Symposium which convened on Sunday was jointly organised by the Ministry of Industry and Trade of Viet Nam (MOIT), the ASEAN Secretariat and the Viet Nam Chamber of Commerce and Industry (VCCI), the Economic Research Institute for ASEAN and East Asia (ERIA) and the Conference of Asia Pacific Express Carriers (CAPEC). Sunday’s symposium and today’s policy dialogue were held at the sidelines of the 42ndASEAN Economic Ministers Meeting and related meetings, which is taking place in Da Nang until 27 August. The full text of the Report of the Symposium and its Recommendations can be found by clicking here. Two new publications designed to attract more foreign investment into the region and to also support ASEAN-based enterprises were launched today in Da Nang, Viet Nam. 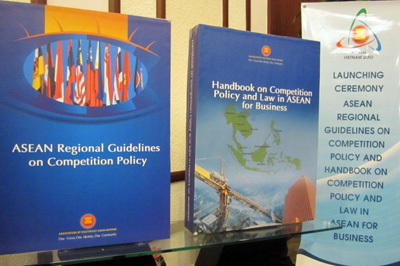 The ASEAN Regional Guidelines on Competition Policy (“Guidelines”) illustrates country experiences and international best practices, while the Handbook on Competition Policy and Law in ASEAN for Business (“Handbook”) provides current approaches and practices relating to competition policy and law in ASEAN Member States. Both publications aim to create a fair and transparent competitive environment in the region, said Dr Vu Huy Hoang, Viet Nam’s Minister of Industry and Trade, at the opening ceremony. He added that the books are meant to help raise awareness among the targeted groups, to develop a competitive culture amongst the business community and to further create a favourable environment for the introduction and enforcement of competition policy and law. 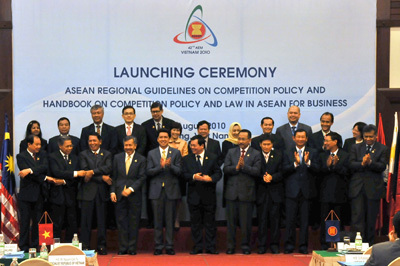 Dr Surin Pitsuwan, Secretary-General of ASEAN, further commented that the Guidelines and the Handbook would lay the foundation for a highly competitive ASEAN Economic Community, thereby enhancing further the dynamic trade and investment relationships between ASEAN and its partners for many years to come. “ASEAN’s total trade in goods now stands at US$ 1.5368 billion. Despite the economic downturn, ASEAN has proven itself to be a competitive region – ASEAN’s share of total global FDI inflows has increased from 2.8% in 2008, to 3.6% in 2009, which accounts for US$ 1.1 trillion,” he added. A series of socialisation forums on the Guidelines and Handbook will be conducted from October to November 2010 in ASEAN Member States, with the participation of government officials, academia and business people. The launching of the books coincides with the 42nd ASEAN Economic Ministers Meeting and related meetings taking place until 27 August. The launching ceremony was also attended by the ASEAN Economic Ministers, the Secretary-General of ASEAN, senior economic officials from ASEAN Member States, high-level officials of the ASEAN Experts Group on Competition (AEGC) and the media. The books were developed by the AEGC, who had technical support from the Federal Foreign Office of Germany. 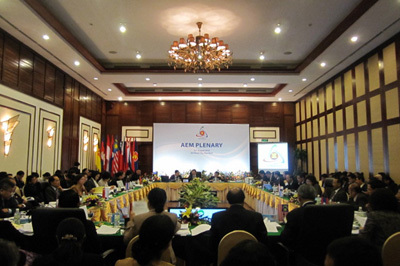 The AEGC was established in August 2007 by the AEM as an ASEAN official body and a regional forum to discuss and cooperate in competition policy and law. The AEGC members comprise head of competition agencies and high-level officials of the respective ministries overseeing the establishment of competition law. Developing an integrated logistics services industry in the region is an important objective in ASEAN and will further accelerate the connectivity among production sectors within and among the Member States. The development of logistics services will enhance trading efficiency in ASEAN, further consolidate the ASEAN Connectivity Initiative, and thus, create a momentum for ASEAN to maintain stability and dynamism in the regional economic development, said Mr Nguyen Cam Tu, Vice Minister of Industry and Trade of the Socialist Republic of Viet Nam. Delivering his opening remarks at the Symposium on the Implementation of the ASEAN Roadmap for Logistics Services Integration in Da Nang, Viet Nam, yesterday, Mr Nguyen said that the ASEAN Economic Ministers had demonstrated this importance by implementing the ASEAN Roadmap for Logistics Services Integration since two years ago. Logistics has been identified as a priority sector in ASEAN’s economic integration process. “The Roadmap will help to accelerate the facilitation and liberalisation of logistic services by 2013 and eventually make ASEAN a logistics hub in the Asia-Pacific region. It is consistent with ASEAN’s common wish of speeding regional connectivity towards the goal of establishing the ASEAN Economic Community by 2015,” added Mr Nguyen. At the Symposium, the ASEAN Secretariat updated the ASEAN Senior Economic Officials, government officials, and representatives from leading logistics services providers in Southeast Asia on the status of implementation of the Roadmap in its five areas: the liberalisation of logistics services and related services; the enhancement of competitiveness of ASEAN logistics services providers through trade and logistics facilitation; the expansion of the capability of ASEAN logistics services providers; the development of human resource in the logistics services industry; and the enhancement of multi-modal transport infrastructure and investment. Mr Subash Pillai, Director of Market Integration Directorate, ASEAN Secretariat, said the logistics services industry plays a double role in the community building of ASEAN. “Logistics services industry in ASEAN is one that is very important to the ASEAN region because it directly contributes to the first dimension of a single market and production base, while acting as an enabler to the second dimension of enhancing ASEAN’s competitiveness in the realisation of an ASEAN Economic Community by 2015,” he explained. He further added that a good logistics services industry in the region will also act as an attraction and provide the pull factor for business to do business in and with ASEAN. On the issue of connectivity, the ASEAN Connectivity Initiative’s three dimensions – physical connectivity, institutional connectivity and people-to-people connectivity – face the challenges of full implementation of all ASEAN logistic-related agreements and keeping abreast with the changes in standards classifications and technology, as well as the promotion of connectivity within regions and among the people of ASEAN. In recent years, improved regional connectivity has seen the land transportation becoming a more viable option, but businesses would still require more information in order to optimise that option. “In terms of time, land transportation enjoys advantage over sea and is favourable in comparison with air, so land transportation is now being seen as faster than sea and cheaper than air. High transportation cost, however, remains an issue and practical information was lacking. The business sector is in need of information, now lacking, to make informed business decisions,” said Mr Tomohiro Kinomoto, Deputy Director of Asian Cooperation Division, Trade and Economic Cooperation Department, Japan External Trade Organisation (JETRO). The symposium also provided ample platform for the logistics services industry in the region to provide their views. In Viet Nam, where the logistics industry is still in its infancy but have already contributed 15 to 20 per cent of the economy’s Gross Domestic Product, local industry players have called for a national action. “There has not been an official unified mechanism governing logistics activities in Viet Nam, so it would be good to establish an inter-ministerial logistics committee consisting of representatives from the Ministries of Transport, and Industry and Trade. Hopefully, a new committee such as this could help to ensure the unity between laws and regulations on logistics and reduce redundancies,” urged Mr Nguyen Giang Tien, Deputy Director General of Vietfracht Company, a leading shipping and forwarding company in Viet Nam with operations worldwide. “We could also have a National Logistics Forum established to speed up the exchange of ideas among the government, bodies in the logistics field, and customers,” he further suggested. “The logistics services industry worldwide is not the mere distance between two locations, but about effectively addressing the cost and speed moving an item between them,” stressed Mr Alan Turley, Vice President for International Affairs and Asia Pacific, FedEx Express. In addition to his call to improve customs facilitation in ASEAN Member States, he also urged for a continued implementation of the Roadmap and the identification of new priority areas for the ASEAN Connectivity Master Plan. The Deutsche Post DHL and TNT Asia also jointly addressed the topic of trade and customs facilitation in the region. The one-day Symposium was organised by the Ministry of Industry and Trade of Viet Nam (MOIT), and co-organised by the ASEAN Secretariat and the Viet Nam Chamber of Commerce and Industry (VCCI), within the framework of the 42nd ASEAN Economic Ministers Meetings and related meetings, which began yesterday in Da Nang until 27 August. The symposium was jointly supported by the Economic Research Institute for ASEAN and East Asia (ERIA) and the Conference of Asia Pacific Express Carriers (CAPEC). The Conference of Asia Pacific Express Carriers (CAPEC) was jointly founded by DHL, FedEx, TNT, and UPS courier companies in 1996 to represent the interests of the world’s leading integrated express delivery services companies based in Asia. The ASEAN Economic Ministers will meet for their 42nd meeting in Da Nang, Viet Nam, on 25 August 2010. Related meetings will be held in conjunction throughout the week, from 22 to 27 August. These meetings include the 4th ASEAN Economic Community Council Meeting, consultations with Economic Ministers from the eight East Asia Summit countries and dialogues with various business councils. The Meetings will also see the launching of two new publications: the ASEAN Regional Guidelines on Competition Policy and the Handbook on Competition Policy and Law in ASEAN for Business. The 42nd AEM, themed “AEC: A Community for Dynamic and Sustainable Growth”, will be the first AEM since the region welcomed the entry into force of Free Trade Agreements with several Dialogue Partners in the beginning of the year. Click here for the official website of the 42nd AEM. The Secretary-General of ASEAN today thanked the Australian Agency for International Development (AusAID) for its assistance to ASEAN and also suggested new areas of cooperation into the future. Meeting AusAID’s Deputy Director-General of Asia Division, Mr Richard Moore, at the ASEAN Secretariat, Dr Surin Pitsuwan expressed his appreciation for AusAID’s contribution to ASEAN including the initial contribution to institutionalise the Agreement on Disaster Management and Emergency Response (AADMER) and the contribution for capacity building of the ASEAN Secretariat. Dr Surin also urged AusAID to explore the possibility of assisting the ASEAN Secretariat in its efforts to enhance its communications capabilities and also on ASEAN’s engagement with civil society organisations. Both parties also discussed the outcomes of the 43rd ASEAN Ministerial Meeting and Related Meetings held in Ha Noi recently especially on ASEAN Centrality. The AMM provided the backdrop for ASEAN’s friends and partners to reaffirm their unequivocal support for ASEAN Centrality. It was very clear that they wanted to see ASEAN continue to play a central role in the emerging regional architecture. Twenty nine tour operators from ASEAN Member States recently concluded a one-month In-Class Training on the Russian Language. Aimed at enhancing communications with Russian tourists, the course was conducted from 6 July to 3 August 2010 in Jakarta by two Russian native speakers. The course was preceded by a two-month e-class learning held since February 2010. Funded by the ASEAN-Russia Dialogue Partnership Financial Fund (ARDPFF), the course was aimed at improving the capacity of tour operators in ASEAN in the use of the Russian language. The course was also designed to enhance the participants’ understanding of Russian culture and way of life as a response to the increasing number of Russian tourist arrivals to ASEAN. At the closing ceremony to mark the completion of the course held on 3 August 2010, the Deputy Secretary-General of ASEAN for ASEAN Economic Community, Mr S. Pushpanathan, said that “Russia is a growing source market for tourism for ASEAN, which has grown by an average of 23% in the last five years, and therefore such training will further help to draw more Russian tourists to the region.” Russian tourist arrivals to ASEAN increased from 140,000 in 2005 to 509,000 in 2009. DSG Pushpanathan suggested that the e-learning system that has been developed should be sustained and promoted so that there will be opportunities for other interested tour operators and tourist guides in the region to enhance their Russian language skills. DSG Pushpanathan also expressed his appreciation to the Government of the Russian Federation for supporting the training and the Ministry of Culture and Tourism of Indonesia for hosting the course. He also thanked the Ministry of Foreign Affairs of Indonesia for being the key proponent in initiating the training under the ASEAN-Russia dialogue relations. He congratulated all participants for successfully completing the course and being awarded certificates. For DSG Pushpanathan’s closing remarks, please click here.